Philosophy is life. It is a search for meaningful existence. It is mapping out our way towards meaningful and significant existence. It aims to clarify our human understanding of anything, including ourselves. It is from these claims that this workbook, A Reflection Manual on Philosophy of Man is intended: to make that way of life realizable in the context of college students. The method in philosophizing and in the understanding of the human person is activity-driven that involves understanding by doing. Since philosophy is art itself, the tools for understanding include seeing, reflecting and acting. Since the workbook is thematic, each theme involves the three tools: seeing involves the observations, the phenomena, or the raw experiences that provoke some inquiries in understanding better our humanity; reflecting includes integrating and clarifying the experiences within philosophical insights regarding the human person; and acting entails the creating of personal insights regarding the judgment drawn from seeing and reflection. The act part involves a personal contribution to the enrichment of understanding the human person. Philosophy is also the love and pursuit of wisdom. As such, the method employed in this workbook is phenomenological in the sense that it intends to present being as the underlying reality in human consciousness. It presents a description of the phenomenon of the human world, yet hermeneutically analyzed within the context of philosophical reflections. The study of the human person is critical and reflective on the human person's nature and unique existence. It provides foundations for a deeper understanding of what and who the human person is, and what it means to be fully human. The workbook is geared to accomplish several general objectives: First, it aims to introduce the students to the different perspectives about the human reality; it also aims to enable the students to cultivate the habit of critical thinking and free inquiry on the human person; 3) (It is also) to integrate the student's learning of the human person in other disciplines and at the same time to enable the students to attain a profound understanding about their human experiences. 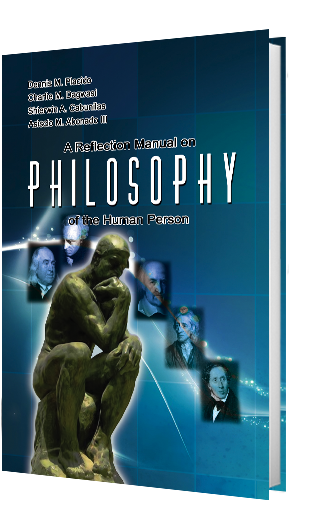 The students are also given the opportunity to analyze and reflect on philosophical insights through reading philosophical texts; and, (4) finally the workbook aims to develop in the students the skills of critical thinking through writing their philosophical insights about the human person. By using the workbook, students are geared to attain these competencies: a) understanding various views on the human person and their implications; b) an informed perspective on the human person; c) improved verbal and written skills in constructing arguments; and d) a disciplined approach, through research, in discussing issues hounding human existence. The workbook thematically addresses the human project regarding: human becoming, freedom, transcendence, egoity, embodiedness, cognition, having, sociality, language, alienation, conscience, commitment, belief and religion, love, art and creativity, suffering and death, being and hope; all of which are geared towards a better understanding of our humanity. After each topic, discussion questions are provided to deepen our seeing-reflecting-acting process. Categories: Our Product, Philosophy. Tags: Asisclo M. Abonado III, Charlie M. Dagwasi, College Books, Dennis M. Placido, Philosophy, Shierwin A. Cabunilas. School is one of the agents from where the personality of human individual would form, it might not be the sole influence but it contributes a lot to the life of an individual since, the basic education system of our country requires the individual to stay in school more than 8 hours a day, 5 times a week_ Through this, one might showcase his/her identity from where he/she is coming and what culture does it bring. Thus, everyone should have the same culture and values as Filipino people who are living in the same country. 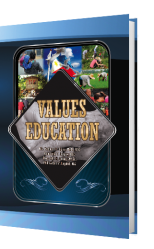 This work/textbook is one of the tools that will help educators, parents and leaders in instilling values to young individuals, most especially the students. Though the parents are the first teacher of values to their children, we can hardly deny the fact that every parent have their own ways and practices of their values. The content of this work/textbook focuses on the human seven core values namely: Truth, Spirituality, Love, Economic Efficiency, Health. Patriotism and Nationalism, and Social Responsibility. From these core values, good Filipino values were formed and developed which means these are the sources of all Filipino values that we have. By knowing these values, we are able to really understand why we have such practices that other countries do not have and why there is belief that other countries do not have. Aside from knowing these values, we will also be informed that we have to, as well, become cognizant of their negative effects on individuals and on others. The following chapters will give a short and concise practical explanation on the seven (7) core values that Filipino people have. Each chapter contains pre-activity, post-activity and post evaluation as well. The pre-activity will check the students' existing knowledge, practices and beliefs that they have on a specific value. The post activity after every discussion will check the learning experience of the students. While the post-evaluation makes the students reflect on how they are going to apply it to themselves, affect other people and improve the community in their own way. With the aim of giving quality teaching and learning experience to teachers, students as well as other community developers, social workers and others doing extension and community services, this worktext is conceptualized and realized. At the end of each chapter are worksheets, which will be answered by the students. These will serve as a form of evaluation on the extent of learning they have gained from each chapter. This hook hopes to fulfill the objectives of the National Service Training Program (NSTP); i.e., to bring back the awareness of students as well as mentors of various traits and values, namely: civic responsibility, patriotism, leadership, assertiveness, concern for people and environment and lastly, to be an active mobilizer of the community working together to solve problems and issues confronting them. The need for preparing the youth for their duties as citizens via the National Service Training Program (NSTP) cannot be overemphasized. As embodied in RepublicAct No. 9163, the NSTP Law of 2011 has ushered a new direction in training the Filipino youth for the duties and responsibilities of citizenship. This citizenship program purports to prepare the youth for their primordial tasks as nation-builders and citizen-soldiers in response to the clarion call of the times. As an educational program and a curricular requirement, it is aimed at transforming the youth into productive assets for local and national development. Based on the findings from history that there are much to be expected from the intrinsic and potential value of the young Filipino, the Program is designed to develop knowledge, skills and values in order for them to become good citizens. 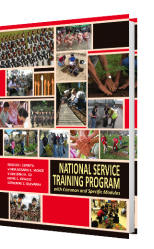 To attain the objectives of NSTP, this modular work-text attempts to present a comprehensive overview of the Program. 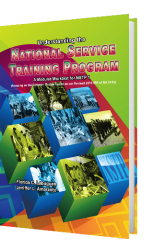 The whole gamut of insights and activities relative to NSTP contained in this work-text satisfies the need for instructional material that meets the prescribed guidelines for the implementation of RA 9163. The student-trainees will find this modular work-text useful, relevant and responsive to the contemporary situation. The zealous and vibrant response of our youth to the realization of the ends of this Program will constitute a covenant in building sustainable communities in the country for national development. on the first leg of part of NSTP, especially along the subjects of the 25-hour common module phase in pursuit of that ultimate end of moulding the young people into civic and defense-prepared individuals for nation building. For comments and suggestions, please contact the Philippine Society of NSTP Educators and Implementers, Incorporated, through e-mail address: PSNEI_INC@ yahoo.com.ph. An endeavor of this magnitude entails an enormous debt of gratitude.